The i-PAD (Intelligent Public Access Defibrillator) is a semi-automated external defibrillator designed for minimally trained individuals. It provides simple and direct voice prompts and clear displays for an easy, straightforward operation. The i-PAD is battery powered and lightweight providing maximum portability. 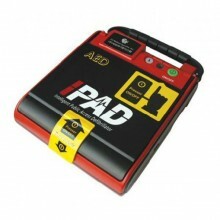 Click the button below to add the iPAD Welmed Defibrillator to your wish list.